Cleveland Cavaliers, after 4 games, were down 3-1. At that point, I read somewhere that they should just give up. “Stop prolonging your own torture”, one reporter said. Because no team has ever come back from a 3-1 loss. Not just that the odds weren’t in their favor. It hadn’t been done before. Basically, it was impossible. Cleveland was playing against Golden State Warriors, the defending champions. The Warriors had already tasted victory. They weren’t going to give up that feeling. It was in their very name that they would fight until the end. It was even more unlikely that the team that hadn’t lost 2 consecutive games all season, would, or even could, lose. 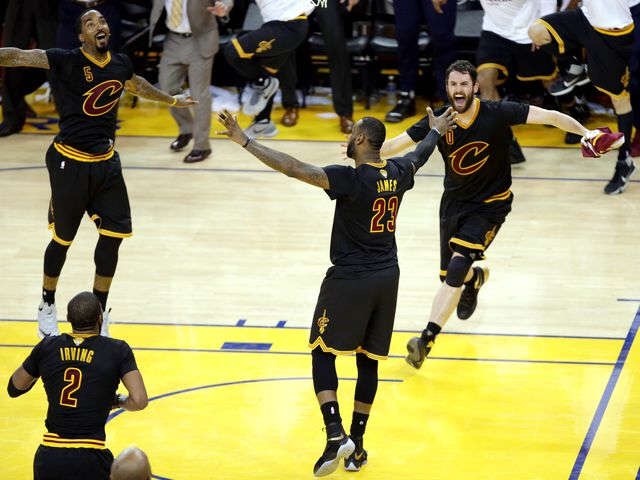 And yet, last night, the yellow confetti rained on Cleveland Cavaliers. LeBron and his team had just won their 3rd consecutive game to claim the victory and bring the first win to their franchise. The world watched and the world celebrated with them. I didn’t watch the whole game. I didn’t have to. Sure, there were great highlights and maybe now I’ll go back and watch the game. It’s one for the history books so it will be available online for years. No rush. But when the basketball parade ends, what can we learn about life? We have proof that the race isn’t over until you decide. You decide. You either quit or win. You either overcome or be overcome. You either keep trying or accept defeat. You either believe the little voice inside you that tells you you can do it, or let that little voice be drowned out by the naysayers and disbelievers. The naysayers have an agenda. They want the win themselves. It’s a bigger story to report your failure. Bad news makes money for media houses. Look at the front pages of tabloid magazines and you’ll see news of unhappy marriages and cheating spouses and former celebrities rolling in the mud after a stint in rehab. Broke. Broken. Unemployable. It’s like no one wants to hear about the longstanding marriages that have endured the hard times; longtime spouses are boring. Yawn. Celebrities living moderate, temperate lives. Double yawn. That’s why you can’t do it for other people. Some of them just aren’t invested in your success. You have to go after your dreams because they matter to you. Because you promised yourself you would do it. Because you pledged yourself to a cause. Because deep inside your gut, you know you can. You know you’re better than the competition, you know you can work harder, the fire inside your belly is hotter and you just want it more than anyone else. Go ahead. Prove yourself right. Last night after the game, we saw a triumphant LeBron James kiss the ground. Humbled. But not humbled as a loser. As a winner. He’d given everything he had and it was enough. He’d done the work and it was enough. He’d kept at it and it was finally enough. This doesn’t happen all the time. But sometimes it does. And if you quit before you get to that point, you’ll never know what the win feels like. Lesson learned: have a dream, believe you can achieve it, work hard at it, work harder than anyone else, and don’t give up until you win. As I have totally fallen off with my Training…took pictures that to all show my setbacks but your reminder is so helpful for me this morning. Sooooo true: Lesson learned: have a dream, believe you can achieve it, work hard at it, work harder than anyone else, and don’t give up until you win. Thanks for commiserating with me. I, too, have fallen off my training. These words are as much for me as they are for anyone else. I have a lot of goals for my year, week and day and yet, I feel like I’m not accomplishing enough. I get sidetracked, distracted, I start giving up when things aren’t going right. I need to commit to my goals and not give up until I win either. Happy Summer day to you. What a great reminder and the perfect post to start the week!!! Thank you for sharing and for linking it up! Absolutely. I tell myself I can do it all the time. It’s important to visualize yourself successful even while working on your success. Great perspective. It’s so true that everyone seems to relish a “bad” story. Unfortunately, failures sell. It is up to us, and really us alone, to chase that dream. To prove. To achieve. Thanks for linking with us Karen. Thanks for that motivation, Hoho. You’re absolutely right. Excellent post you made some great points well said. Thanks so much Tricia. I really appreciate the comment!